When children don't eat enough calories, they fail to thrive energetically and physically. They may not meet growth markers, and if they have a serious illness, they may have trouble bolstering their immune system and living a healthy lifestyle. Kids who don' t have much of an appetite or are picky eaters may be willing to drink shakes that you pack with calories and nutritious ingredients. Your doctor can help you determine if your child -- whether a preschooler or preteen -- needs to gain weight. Usually kids who consistently fall in the bottom 5 percent for body mass index are considered underweight. Liquids sometimes go down easier and are better received by kids than whole foods. A shake also enables you to pack a lot of nutrition and calories into a concentrated dose. Dietitian and author Janet Brill notes that kids are often deficient in protein, iron, calcium, vitamin D, omega-3 fats and many vitamins and minerals, such as potassium and vitamin C, present in fresh fruits and veggies. Weight-gain shakes for kids that include foods such as flaxseed, peanut butter, spinach, milk, yogurt and fresh fruit go a long way toward boosting these nutrients and adding significant calories. Although foods such as ice cream do add a lot of calories to a child's diet, avoid relying on sugary options. Instead, opt for nutritionally dense ingredients such as avocados, coconut oil, full-fat dairy, bananas, nut butters, seeds and 100 percent juices. For example, blend together whole milk, frozen blueberries and peaches, peanut butter, banana, flaxseeds and a few leaves of spinach for a high-calorie snack. Alternatively, use avocado, frozen bananas and raspberries, cocoa powder, coconut oil and milk for a creamy taste treat. Adding a serving of instant breakfast drink or a scoop of powdered dry milk further increases the calorie content of shakes, especially helpful for older kids. 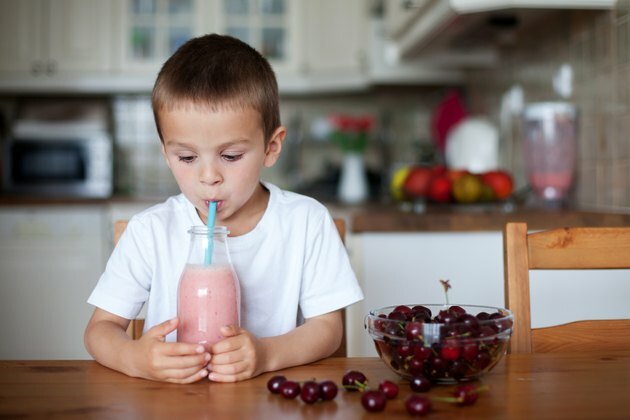 Although homemade shakes are best because you can tailor them to your child's tastes, commercial products are more convenient -- especially if your child is often on the go. Avoid weight-gain supplements targeted to adults like bodybuilders because these often contain extra amino acids and other supplements that aren't appropriate for a child's size or growth needs. Instead, seek out prepackaged shakes and powders designed for kids. Your doctor can direct you to the most appropriate products. Give your child weight-gain shakes between rather than during meals. A shake with a meal may fill him up so much that he isn't willing to eat any whole foods. Meats, starchy vegetables, cheese, eggs and beans offer important nutrition, too. Brill notes that having three meals per day is an essential way to supply your child with the calories and nutrients she needs. Weight-gain shakes should be a supplement, not a meal replacement. Your child's age and weight-gain goals influence the serving size and frequency with which you serve him shakes. Discuss what's appropriate for your child with his doctor or a registered dietitian.